Clark’s Fork of the Yellowstone River, named after Captain William Clark of the Lewis and Clark expedition, is a tributary that originates near Yellowstone National Park and meets the Yellowstone River about ten miles from my house in Billings, Montana. In this area of the country it seems like half of everything is named after Lewis and/or Clark. Captain Clark never traveled on the tributary that bears his name. My friend Roger invited me along on a trip in his Jeep to the Clark’s Fork Canyon. After a couple hours of highway driving, we arrived at an off-road trail that follows the tributary several miles into Clark’s Fork Canyon in Wyoming, just east of Yellowstone National Park. After an hour or so of slow driving on rugged terrain, including crossing some (thankfully) shallow streams, and a fair bit negotiating boulders, we arrived at the location of this photograph. We were the only ones there. 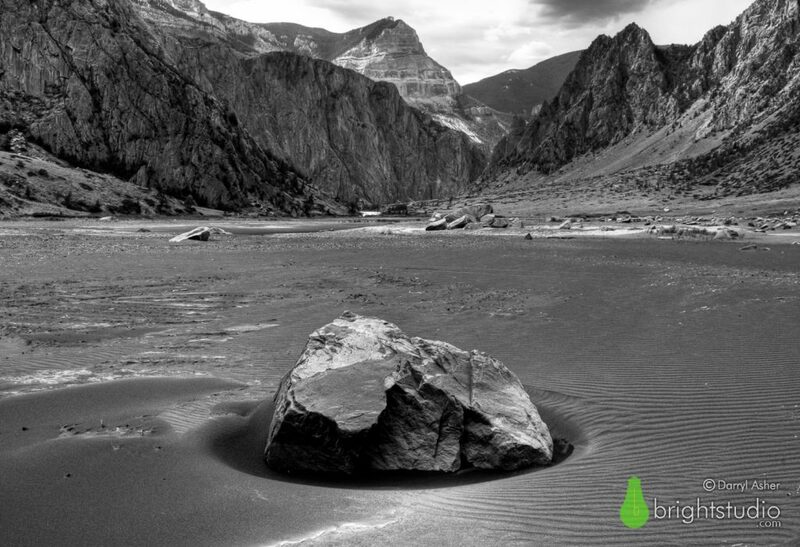 The water level was low, leaving an alien-looking landscape, including this impressive boulder mimicking the shape of the distant mountains. I don’t know what phenomenon caused the indentation to form around the boulder, but it made it look like boulder had been dropped from the sky. I’m not an “outdoors-man” by any definition. I enjoy nature even though I seldom get very far from the main roads. But there’s a special feeling that’s hard to explain when you’re in an area like this. Once the Jeep motor was off, time seemed to stand still and there’s a quiet stillness unlike anything else. You don’t realize how much background noise there is in everyday life until you get far away from it. It’s surprising how far you have to get away from a highway before you can no longer hear the traffic, even in a sparsely populated area like Wyoming. I wanted to try to capture that feeling of quiet isolation and beauty. I took several shot with my Nikon DSLR and this one was my favorite. I converted it to black and white and adjusted levels and contrast, but it’s otherwise just as the scene existed. Sometimes you have get off the beaten path to have an amazing experience. I certainly don’t do it enough, and I thank my friend Roger for giving me this experience. Available in the shop as a 13×19 inch print, produced with archival, museum-quality materials. Remember to sign up for a chance to win a free print of your choice.